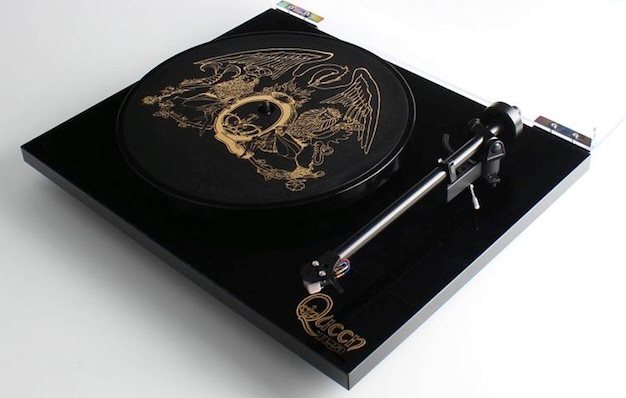 This multi-award winning turntable is designed and engineered to achieve outstanding performance way beyond the expectations of a product at this price point. The minimalist design of the RP1 and the use of extremely high quality components throughout ensure this amazing product will deliver unrivalled performance for the price. Excellent build quality, reliability and the ease of use of this ‘plug and play’ design, combine to make a product guaranteed to offer a lifetime of musical enjoyment. The only thing entry level about the RP1 is the price.•Plug and Play design, set-up in less than thirty seconds. •Hand assembled RB101 tonearm. •High quality, low vibration motor. •Phenolic resin, flywheel effect platter. •Factory fitted Carbon moving magnet cartridge. •Performance Pack upgrade available factory fitted or as an aftermarket upgrade pack (optional). Brand new RB110 tonearm built with the new Rega designed, bespoke, zero play bearings with ultra-low friction performance (Patent Pending). New bias assembly and integrated arm clip. 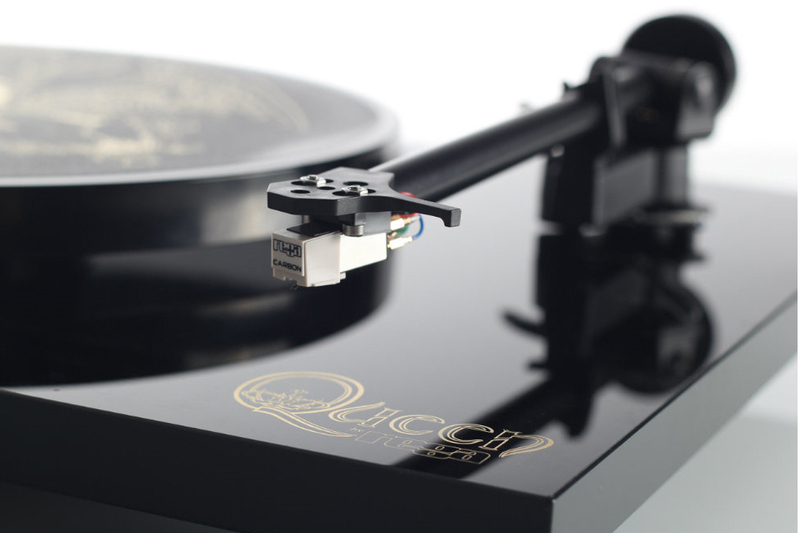 Includes automatic bias adjustment negating the need for the user to set bias, making this the most ‘Plug & Play’ turntable we have ever manufactured. New ergonomically, re-designed and stiffer headshell for improved usability and appearance. Cartridge Rega Carbon cartridge supplied fitted as standard. 24v synchronous motor The first entry level Rega turntable to use a 24v, synchronous AC motor with a new motor PCB and aluminium pulley offering low noise and better speed stability. Plinth Brand new Thermoset, gloss laminated plinth with vastly improved appearance and new ergonomically positioned on/off switch located on the underside. Two stunning plinth finishes available, gloss black and gloss whit Central Bearing housing Re-designed brass main bearing, offering improved fit and removing stress on the bearing itself whilst minimising the transfer of potential energy. (Patent pending) Platter Brand new, 23mm, higher mass, phenolic platter with improved flywheel effect for improved speed stability. Re-Designed feet New improved feet to increase stability and reduce vibration transfer. Motor cover tray New motor cover tray with integrated cooling. 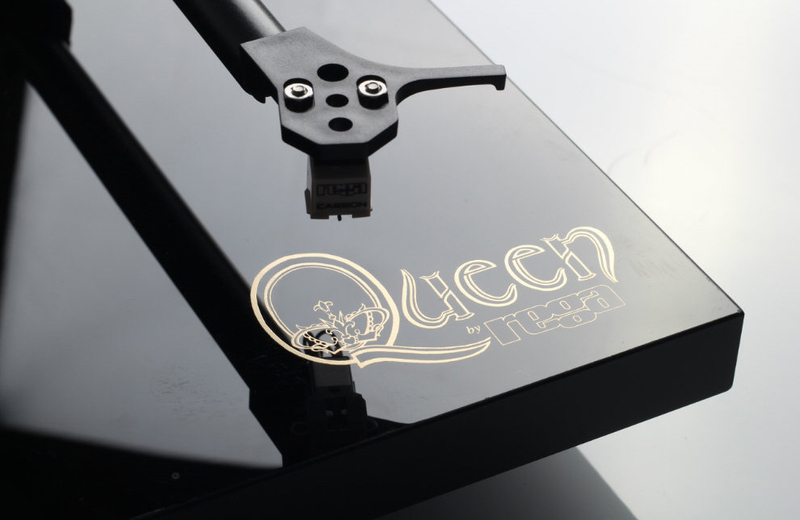 nuovissimo giradischi progettato appositamente per i 'Queen’, base in acrilico high gloss con logo ‘Queen byRega’, piatto ‘Queen crest’ che utilizza un logo creato da Freddie Mercury, braccio RB101, testina Rega Carbon MM, motore a basso disturbo e bassa vibrazione 24v sincrono. Nuovo braccio RB330 massima stabilità e (quasi) zero attrito, nuovo cavo phono REGA, nuovo contrappeso, telaio in acrilico lucido, doppie staffe per massima rigidità, nuovo piatto in vetro da 12mm, nuovi piedini per aumentare la stabilità e ridurre le vibrazioni, Motore 24V con nuova scheda di controllo pronta per la TTPSU. bianco - nero high gloss .rosso • Testina non inclusa. 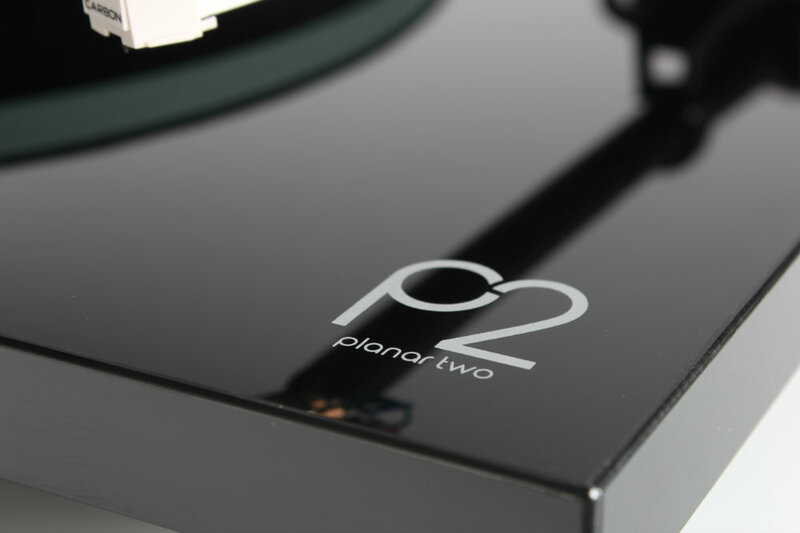 RP3 Turntable The multi award winning RP3 is the latest incarnation of the world famous Planar 3. Delivering serious performance at an unbeatable price, the RP3 guarantees to integrate into any hi-fi system effortlessly. 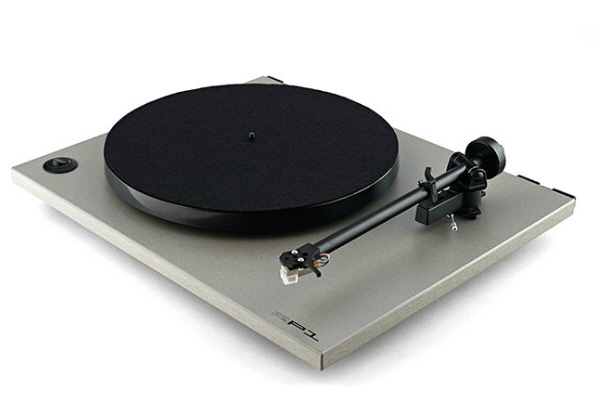 The RP3 uses our lightweight high rigidity plinth design, a float glass platter, precision bearing and our unique double brace technology, all mounted with the hand assembled RB303 tonearm.The RP3 also benefits greatly from a low vibration, low noise, 24v motor that is hand tuned to its own circuit before fitting. This circuit is designed to minimise vibration transfer and maximise performance.You can also specify to have the award winning Rega Elys2 moving magnet cartridge, factory fitted (recommended). All of these features combine perfectly to extract more detail from your vinyl than ever before.Rega has pioneered the use of lightweight rigid plinths. Clever use of lightweight particulate core with a highly rigid phenolic resin skin became the foundations of the high level of performance achieved by the now iconic Planar turntable range. The RP3 takes this design philosophy to the next level. A super lightweight plinth combined with a phenolic resin double brace mounted specifically where the increased rigidity is required (between the tonearm mounting and the main hub bearing) forms a structurally sound "stressed beam" assembly. This rigid plinth design prevents energy absorption and unwanted resonance, which will add unnatural distortions to the music. Equally, heavier mass can transfer more unwanted energy, such as motor or bearing noise directly into the rotating record. The use of braces instead of the complete skin allows double thickness phenolic resin in these key areas while providing further weight reduction to the plinth which directly addresses the issue of mass absorption and unwanted energy transmission.RB303 Tonearm - Making the best better Designed using the latest 3D CAD & CAM technology, the new RB303 is the culmination of more than 30 years of tonearm design experience. Due to advances in technology, we have been able to fine tune the iconic RB300 tonearm design. Featuring a brand new tube with increased rigidity to the bearing housing, arm carrier and headshell coupled with intelligent redistribution of mass ensure this arm will exhibit fewer points of possible resonance. 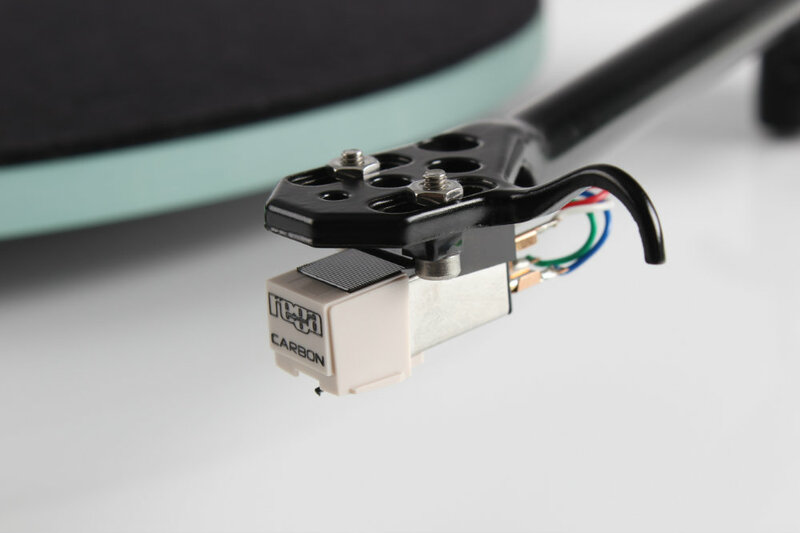 Extreme stability with almost friction free movement from the high precision bearing assemblies guarantees to gather more information from your vinyl than •Hand assembled RB303 tonearm. •24v low noise motor / float glass platter.•Lightweight double braced plinth.•Precision main bearing. •Factory fitted Elys2 MM cartridge (optional). Compatible with the TT-PSU electronic speed change and power supply box (optional). Il Planar 6 è stato costruito sull'enorme successo di RP8 e RP10, è il primo giradischi Rega costruito con una base in un materiale ultra-leggero creato per l'industria aerospaziale, racchiuso in un nuovo laminato ad alta pressione sottilissimo e rigidissimo, in una finitura grigia scura opaca con bordo lucido; il Planar 6 è dotato di un sottopiatto intero in alluminio, un nuovo motore 24V sintonizzato a mano ed abbinato alla sua nuova alimentazione separata NEO e all'apposita puleggia, dotata della cinghia upgrade come standard. • Braccio RB330 – Progettato utilizzando le più recenti tecnologie CAD e CAM 3D, il nuovo RB330 è il distillato di 35 anni di esperienza nella progettazione di bracci. Una nuovissima sede per lo snodo e l’ultimissima versione dei tubi a redistribuzione intelligente della massa assicurano a questo braccio il minimo numero di punti di risonanza. La grandissima stabilità combinata con la quasi nulla frizione del nuovo cuscinetto ad alta precisione permettono di raccogliere più informazioni che mai dal vostro vinile.• Telaio in Tancast 8 (materiale sviluppato per uso aerospaziale) • Finitura ‘Polaris Grey’ • Nuova cinghia • Nuovo alimentatore separato Neo PSU • Nuovo motore sincono 24 V a bassissima vibrazione accoppiato in fabbrica uno a uno con l'alimentazione Neo PSU. • Nuova cappa parapolvere smoked. • Testina non inclusa. RP 8 giradischi completo di braccio RB 808r senza testina telaio skeletai completo di supporto e con alimentazione esterna a controllo elettronico psu- colori nero • Testina non inclusa. RP8 Turntable. 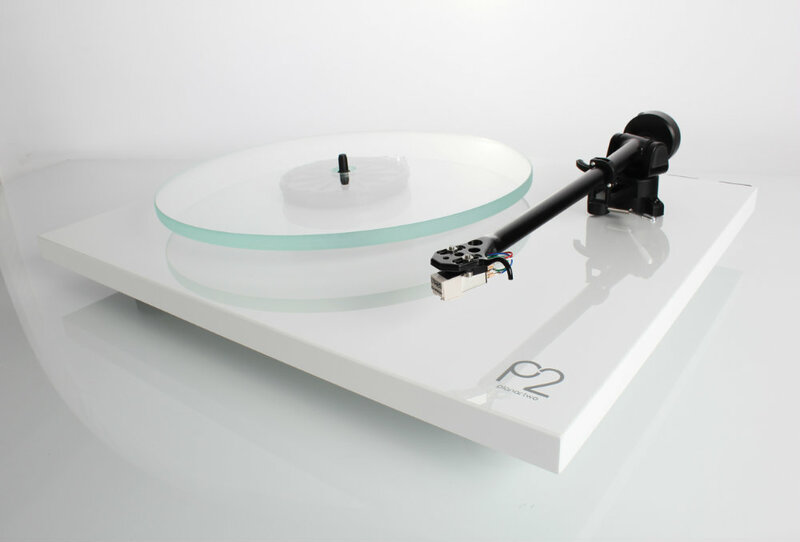 The RP8 is a ground breaking turntable which takes Rega’s design philosophy further than ever before. 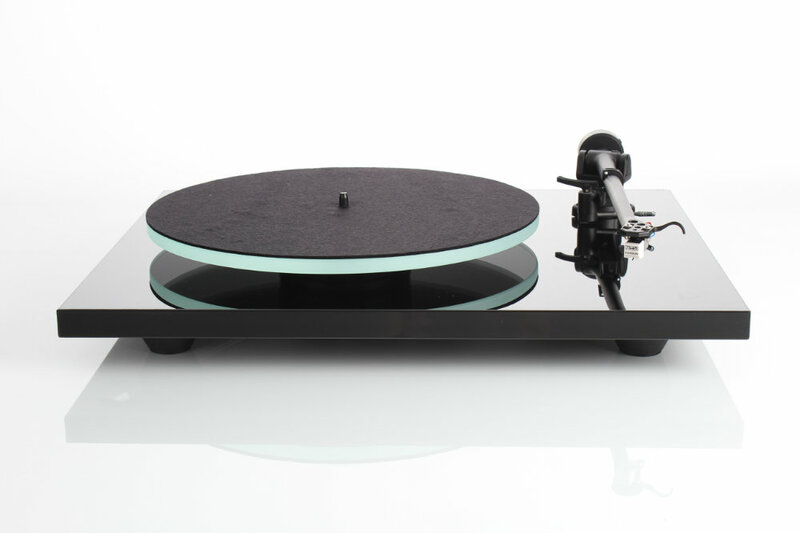 A radical new plinth design using custom materials, the RB808 tonearm , 24v low voltage motor controlled by a customised hand tuned electronic power supply, a triple layer float glass platter and a re-designed and improved version of our Planar 9 precision engineered hub bearing assembly. Available with the option of the RP8’s perfect partner the Rega Apheta moving coil cartridge factory fitted (recommended). 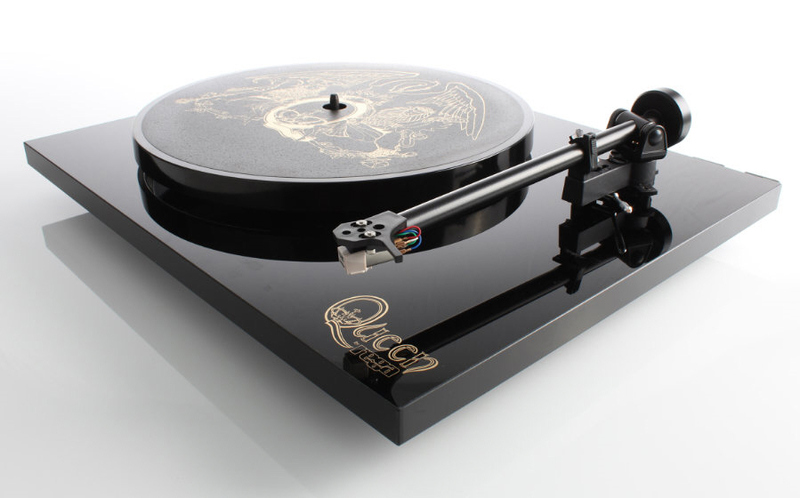 These are just some of the features of this amazing turntable designed to extract more music from your vinyl than ever before. In 2013 the RP8 was voted “one of the best designs of all time” by two of the worlds most respected designers, Apple’s Sir Jony Ive and Marc Newson. The Evolution of Revolution Evolution is a well proven and documented process in many areas of our lives. This applies in particular to design engineers and machines. Over the past forty years our cars have become more reliable and economical whilst we take for granted the reliability and speed of modern aircraft. 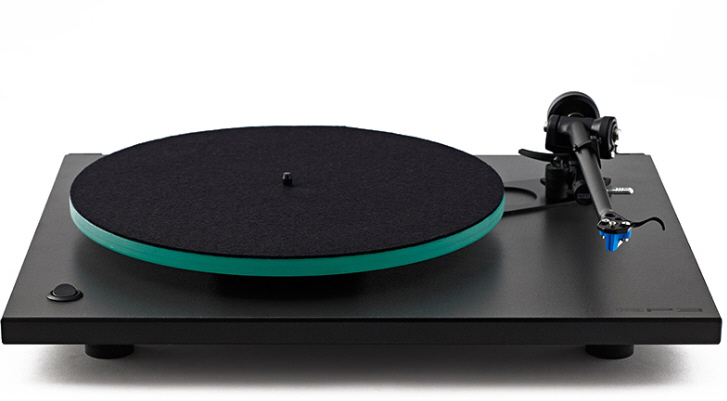 Rega is no exception to evolution. Rega’s experience and previous achievements allow us to continually develop and produce better products. 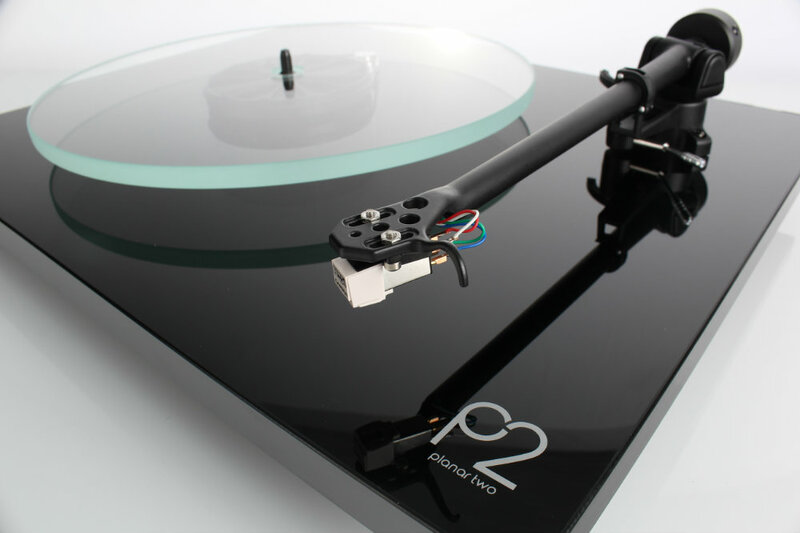 The RP8 represents probably the biggest step forward in the evolution of Roy Gandy’s turntable design philosophies. Low mass, high rigidity plinths combined with electronically controlled low vibration motors, high flywheel effect platters and lower mass higher stability tonearms. The RP8 is the first of our “skeletal” design turntables offering ground breaking levels of performance and amazing value for money.RB808 Tonearm The RB808 tonearm is packed with new features pushing the boundaries of tonearm design. All Rega tonearms are meticulously hand built by a team of highly skilled technicians. The RB808 has improved bearings and a tightened spindle fit tolerance over previous models (each bearing is individually selected to find the perfect match for the chosen spindle). This is a proven method of increasing the amount of detail retrieved from the record surface. A brand new low mass precision engineered vertical bearing assembly has been manufactured to further compliment the inherent design philosophy of the RP8 turntable. 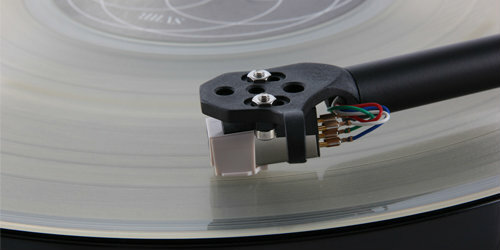 The RB808 uses the latest Rega arm tube. Completely redesigned to redistribute mass, further reduce stresses and resonances. This advanced design tube increases the stiffness and rigidity of the overall assembly using CAD design to blend the multiple varying tapers. Externally we have fitted a bespoke Rega designed low capacitance phono cable, which uses an advanced phono plug assembly. This has only two parts to minimise joints and incorporates a twist and clamp design locking the plug to the terminal. The design increases connectivity and ensures the signal path is kept as clean as possible. Custom TT-PSU power supply The compact TT-PSU uses a high stability, crystal locked, low distortion sine wave generator. This, along with an efficient drive amplifier fed from a stabilised DC power supply, generates a 24v AC balanced signal of less than 0.05% distortion, which is completely un-affected by any changes in the mains/line voltage and conditions. This then drives the improved Rega anti-vibration circuit built into the RP8 motor PCB. Magnesium and Phenolic - Dual bracing A super lightweight plinth combined with a double brace mounted specifically where the increased rigidity is required (between the tonearm mounting and the main hub bearing) forms a structurally sound “stressed beam” assembly. This design prevents energy absorption and unwanted resonances which will add un-natural distortions to the music. The RP8 takes our double brace technology to the next level. 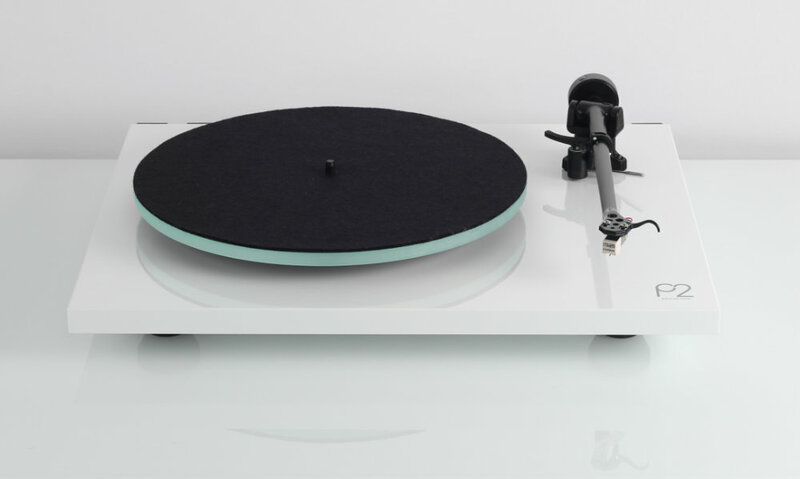 Not content with an unprecedented stiffness to mass ratio, Rega have obsessively reduced any resonant properties by using two different materials for the new stressed beam. The top layer is magnesium and the bottom layer is phenolic (two of the lightest and stiffest materials available). Incorporating two different materials into the brace structure lowers their ability to pick up unwanted airborne vibrations. Simply put, different materials have different natural resonance. By using two different materials together they decrease the natural frequency of each other by self-damping. 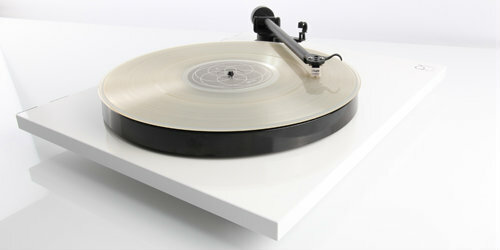 N.B Rega will always use materials in the form that achieves maximum performance. The raw magnesium will develop patina and change colour over time, this is perfectly normal. Coating to prevent this discoloration would affect sonic performance therefore the material remains raw. If you wish to bring the shine back to your magnesium top brace careful use of metal polish will restore it to its original condition. Super flywheel effect triple layer glass platterThe new RP8 three piece laminated glass platter is the result of collaboration with a small, emerging, young British glass engineering company. As a general rule the only part of a turntable that requires extra mass is the turntable platter in order to achieve constant rotational speed. However a heavier platter creates more problems for the main bearing design so again an ideal compromise creates the best solution. Practically this means keeping as much of the mass to the outside rim of the glass platter to create more flywheel effect but keeping the inside of the platter as light as possible without sacrificing stiffness. 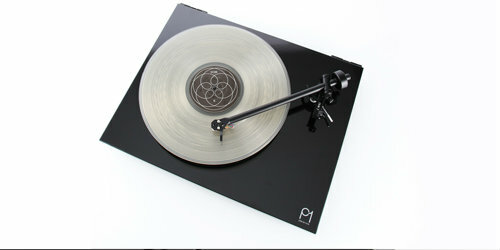 The RP6 was the first Rega turntable to use a precision engineered glass ring laminated to the outside using modern CNC techniques to ensure concentricity.The RP8 takes it one step further by laminating three rings together to produce the RP8 super flywheel effect glass platter - an engineering triumph ! Skeletal plinth design with polyolefin foam core Controversially Rega has always researched methods of producing light but stiff and rigid plinths. The technology is simple: unwanted noise at microscopic levels is developed by the turntable motor and main bearing. The plinth can also pick up airborne vibration from the music. From the beginning in the 1970’s, Rega pioneered the use of a stressed skin structure for the plinth. This uses two layers of phenolic resin with a lightweight particle or fibre board sandwiched between the skins. 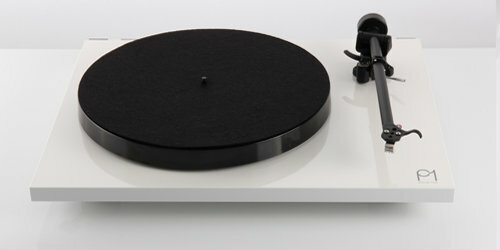 This technique has been used in many applications where stiff, light structures are needed such as an aircraft wing or a Formula 1 chassis.The current increase in interest in turntables has allowed Rega to research and develop higher technology structures for the customer who is happy to pay a little more for higher sound quality. 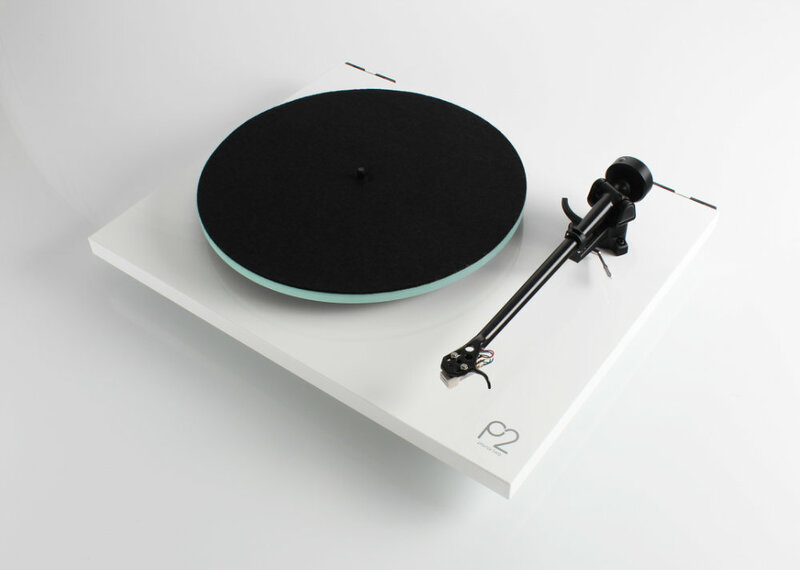 The RP8 turntable utilises a unique new stressed skin structure produced from thin phenolic skins sandwiching a featherweight nitrogen expanded, closed cell, polyolefin foam core. This material has been developed exclusively for Rega over a three year period. The RP8 plinth is 7 times lighter than the weight of the original Planar 3 plinth. 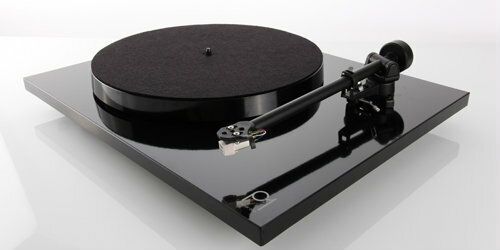 Rega has added even more stiffness in the crucial area between the arm and the main bearing. 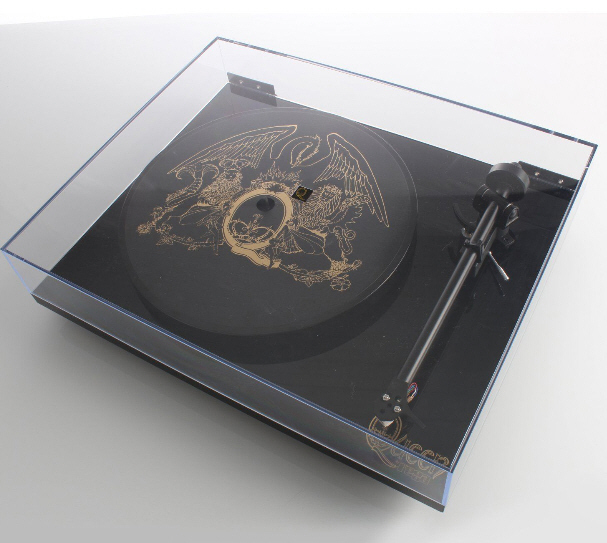 De-coupled outer frame and dust cover A common problem for many skeletal design turntables is the inability to incorporate an effective dust cover into the design. We have constructed an outer frame that minimises contact between the inner and outer plinth. The only points of contact are three location devices on the feet which centralises the inner and outer plinths perfectly. This makes set-up extremely easy and allows the use of a dust cover. 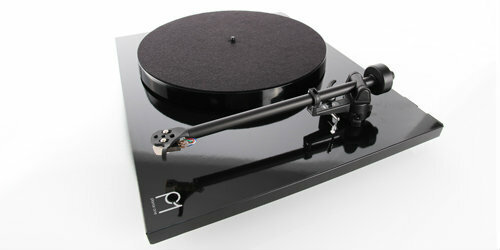 The RP8 can be used without the outer frame if so desired.Key features: Hand made RB808 tonearm / precision engineered bearing and aluminium sub platter/ triple layer float glass platter / custom matched TT-PSU individually tuned to its own motor / Rega’s pioneering skeletal plinth design / Apheta MC available as factory fitted (optional) / Magnesium and phenolic bracing.•Hand made RB808 tonearm.•Precision engineered bearing and aluminium sub platter.•Triple layer float glass platter.•Custom matched TT-PSU individually tuned to its own motor.•Rega’s pioneering skeletal plinth design. •Factory fitted Apheta MC cartridge available (optional). •Magnesium and phenolic bracing. RP 10 giradischi completo di braccio RB 2000 senza testina telaio skeletai piatto in ceramica completo di supporto e con alimentazione esterna a controllo elettronico psu- colori nero • Testina non inclusa. The Apollo-R is the result of many years of innovation, advanced software development and elegant engineering solutions researched by our highly skilled team of engineers and designers. It took the completion of two of our multi award winning products, the flagship Isis CD player and the Rega DAC, to pave the way for a unique product we feel encapsulates everything the new Apollo-R should be.Design history The original Apollo CD player launched in 2005. It was a huge success selling almost 20,000 units worldwide. The Apollo was a unique player featuring Rega’s own software and control system ensuring no other manufacturers player could sound the same. This key element is carried forward and improved into Apollo-R. Analogue & digital outputs Development of the analogue, digital and control domains ensured direct improvements of both analogue and digital outputs making the Apollo-R a perfect partner for the Rega Brio-R amplifier and an ideal ‘CD format’ front-end for the Rega DAC. The Apollo-R internal circuitry has also been improved by tightening the PCB layout. Compact case design Apollo-R is a top loading design housed in a custom, compact aluminium case matching the Rega DAC and Brio-R amplifier. Dedicated CD mini system remote controlA new dedicated CD remote handset is supplied as standard which also has the advantage of Rega amplifier functionality . Digital to analogue conversionThe DAC and the output amplifier of the Apollo-R have been enhanced using the Wolfson WM8742 digital to analogue converter, the same integrated circuit found in the Rega DAC.Power supplies The ‘digital’ power supplies feeding the CD processor, optical block, laser diode amplifier and slicer have been enhanced. This is achieved by using the same high performance, low noise power supplies found in the same location within the Isis CD player. This vastly improves the playability, error correction and the ‘inner core’ processing of the digital CD ‘spinner’ part of the Apollo-R.Output amplifierThe discrete output amplifier has been tweaked to reduce the overall THD from typically 0.005% to 0.0025%, whilst at the same time improving the overall sound quality of the output amplifier.User interface We have improved the user interface control by using a dedicated display micro-processor, which eases the workload on the main control processors giving an improvement in the control code stability, usability and improved speed of initialisation of the disc being played which now matches that of the Isis CD player •New Wolfson WM8742 DAC •Enhanced Output amplifier circuit•Enhanced Digital power supplies•Improved user interface•Redeveloped Analogue & Digital outputs•CD remote with amplifier functionality•Dimensions: Width 220mm x Depth 320mm x Height 90mm •Dimensions needed to operate: Width 220mm x 350mm Depth x Height 180mm. 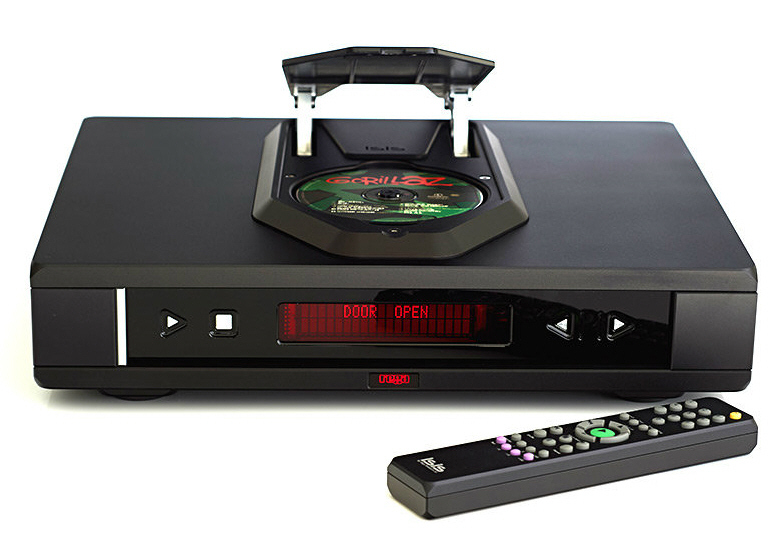 Saturn-R The Saturn-R CD-DAC player offers complete flexibility and integration into any system. Essentially two products in one, the Saturn-R houses a high specification transport and independent DAC circuit. Both sections are fully remote controllable via the supplied Solaris remote handset. You will find plenty of connectivity options, all at the highest possible resolution up to and including 192KHz-24Bit. The Saturn-R has two optical inputs, two Co-Axial inputs, a fully asynchronous USB and an added ‘direct’ digital output from the CD playback section. This ensures the Saturn-R integrates perfectly into any system and provides the perfect partner for the Rega Elicit-R integrated amplifier. CDP Features The Saturn-R uses our proven digital to analogue converter and analogue output amplifier technology coupled with a pair of Wolfson WM8742 digital to analogue converter IC’s. The Saturn-R has improvements to the CD section power supply which was a result of the research & development of our reference Isis CD player along with the improved microcontroller and display drivers. Technology The Saturn-R uses a high stability master clock and high capacity power supply in the CD circuitry, high performance PLL digital interface receiver, isolated digital inputs and high performance power supply architecture in the DAC circuitry. 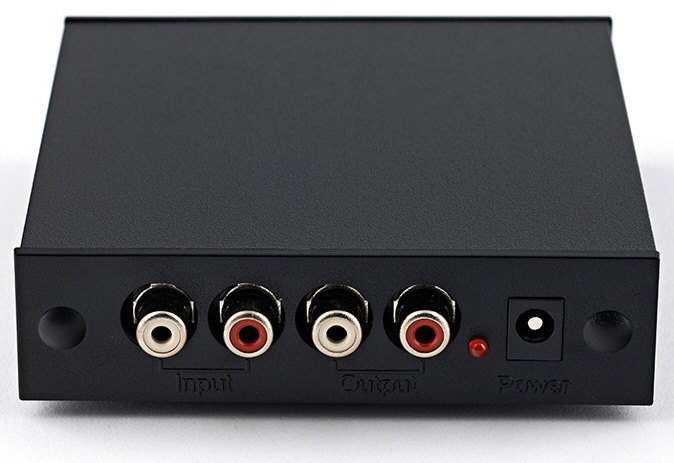 Signal switching between the CD and DAC functions are performed in the digital to analogue converter stage. The signal path of the CD section in CD mode is kept to a minimum. USB 192KHz-24bits asynchronous The DAC USB input has been improved with asynchronous operation at sample rates of 44.1 to 192 KHz with a bit rate of up to 24bits. The USB input has the same galvanic isolation as used in the Rega DAC. The USB uses dedicated drivers in the computer, enabling full ASIO operation, thus eliminating signal degradation caused by generic windows based drivers. Saturn-R XMOS USB DRIVER V2.15.0 Before you can use the USB function of the Saturn–R you must first download the Rega USB Windows driver and install it on your PC. Located under ‘ Product Downloads’ on this webpage. Follow the instruction for installation. Once installed, USB will be ready to use. This driver is not required for MAC OS. •New Wolfson WM8742 DAC•Enhanced Output amplifier circuit•Enhanced Digital power supplies•Improved user interface•Redeveloped Analogue & Digital outputs•Solaris remote with CD, DAC and amplifier functionality•USB 192KHz-24bits asynchronous•Dimensions: Width 432mm x Depth 325mm x Height 82mm•Dimensions needed to operate: Width 432mm x 350mm Depth x Height 180mm. Developed by our engineers, the new Ear benefits from a completely new surface mount PCB layout based on the hugely successful Brio-R amplifier. Exceptional performance is guaranteed with the convenience of independent mute, volume control and multiple connectivity options to integrate perfectly into any users system.Power Supplies & Noise Reduction The Ear pushes the Brio-R power amplifier circuit concept to a new level with the use of a low noise, fully regulated, supply. Noise has also been kept to a minimum by the use of an external mains transformer. The Ear exceeds the voltage requirements of IEC 268-15. This along with low output impedance makes it suitable for studio use as well as a hi-fi headphone amplifier. The Ear operates in Class A at normal listening levels. High Quality Components The Ear utilises the highest quality components and our engineers’ experience, to achieve the best sonic performance. Utilising the design ideals of the ‘cascaded emitter follower output stage’ with a pair of complementary Darlington output transistors, along with polyester film and Nichicon FG capacitors in critical positions, ensures it is our most advanced performing headphone amplifier to date. Custom Case Housed in a compact custom case, the Ear is designed to match the current range of Rega electronics with a matching, high gloss, front facia.The new Ear Headphone amplifier benefits from an all new extruded aluminium case and new styling giving it more of a family feel to match its illustrious big brothers. The Ear simply connects to the tape output of an amplifier via phono leads. The headphones are plugged into the front panel and there is a link socket in case you need your •Maximum output level - 25 load 775mW, 32 load 685mW, 50 load 530mW, 100 load 320mW, 600 load 60mW •Open circuit voltage 6v•Input impedance 20K, Gain 28dB •Frequency response 12Hz to 37KHz •THD typically 0.003% •Signal to noise ratio referenced to max output level -100dB (22Hz – 22KHz) •Maximum Power requirements - 24VAC at 225mA (685mW 32) •Dimensions: Width 178mm x Depth155mm x Height 45mm. The Fono MM is a moving magnet disc stage which has been designed to be effective, easy to use and above all reproduce music. 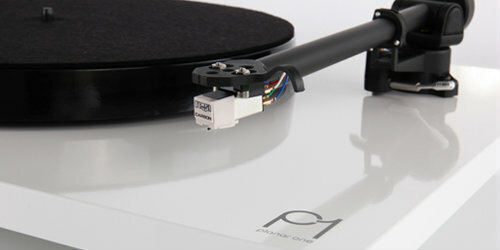 The new surface mount board layout has been optimised to work with the latest generation of RP turntables.This compact design, now housed in our custom case to aesthetically match the rest of the range, offers performance way beyond that expected at this price point and makes an excellent addition to any vinyl based system. The Fono MM simply connects to the line input on the amplifier and the tonearm leads and earth (if used) to the input sockets and earth terminal of the Fono MM back panel.•Input sensitivity = 3mV for 200mV output / Input loading = 47KW in parallel with 100pF•Maximum input level = 100mV •Minimum output load impedance = 36.5dB•Power requirements = 24v AC @ 110mA (Rega PS1) •Frequency response (50KW load) = 17Hz (-3dB) to 100KHz (-0.2dB) •RIAA accuracy (50KW load) = +/-0.2dB 100Hz to 100KHz•Dimensions: Width 178mm x Depth140mm x Height 45mm. testina MC che utilizza la stessa bobina delle altre MC Rega, avvolta a mano e molto complessa, posizionata in un corpo estremamente rigido che assicura una costruzione molto accurata e il tipico metodo di fissaggio Rega a tre punti, Ania ha un magnete in neodimio; tutto questo consente grande libertà di tracciatura ed elevato dettaglio, maggiore dinamica ed equilibrio. RB202 Tonearn The RB202 is the latest incarnation of one of our most popular tonearms, the original RB250. The latest design takes full advantage of our brand new arm tube and the current three point arm mounting system. Each RB202 is a hand assembled, creating a precision crafted tonearm achieving extremely low friction levels and performance way beyond the expectations of a product at this price point.The hand assembled Rega RB202 tonearm is a precision crafted product. To create the low friction levels and meet minimum mass requirements many parts of the arm are delicate and require careful handling. The arm should always be treated with respect to achieve best performance. RB303 Tonearm Making the best better Designed using the latest 3D CAD & CAM technology the new RB303 is the culmination of more than 30 years of tonearm design experience. Due to advances in technology we have been able to fine tune the iconic RB300 tonearm design.Featuring a brand new tube with increased rigidity to the bearing housing, arm carrier and headshell, coupled with intelligent redistribution of mass, ensure this arm will exhibit fewer points of possible resonance. Extreme stability with almost friction free movement from the high precision bearing assemblies guarantee to gather more information from your vinyl than ever before. RB808 Tonearm The RB808 tonearm is packed with new features pushing the boundaries of tonearm design. As with all Rega tonearms each one is meticulously hand built by a team of highly skilled technicians. The RB808 has improved bearings and a tightened spindle fit tolerance over previous models (each bearing is individually selected to find the perfect match for the chosen spindle). This is a proven method of increasing the amount of detail retrieved from the record surface.A brand new low mass precision engineered vertical bearing assembly has been manufactured to further complement the inherent design philosophy of the RP8 turntable. 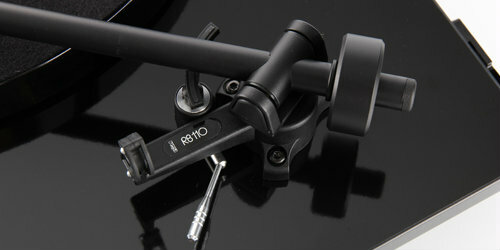 The RB808 uses the latest Rega arm tube. Completely redesigned to redistribute mass, further reduce stresses and resonances. This advanced design tube increases the stiffness and rigidity of the overall assembly using CAD design to blend the multiple varying tapers Externally we have fitted a bespoke Rega designed low capacitance phono cable. Which uses an advanced phono plug assembly. This has only two parts to minimise joints and incorporates a twist and clamp design locking the plug to the terminal. The design increases connectivity and ensures the signal path is kept as clean as possible. RB2000 Tonearm The RB2000 tonearm is packed with new features pushing the boundaries of tonearm design. As with all Rega tonearms, each one is meticulously hand built by a team of highly skilled technicians. The RB2000 uses improved bearings with each one being hand selected to be an interference fit with the paired spindle matching both the inside and outside diameters. This is a Rega developed method of increasing the amount of detail retrieved from the record surface, designed specifically to maximise performance of the tonearm and cartridge.The entire tonearm structure is designed to have the minimum of mechanical joints whilst using the stiffest materials in all critical areas. 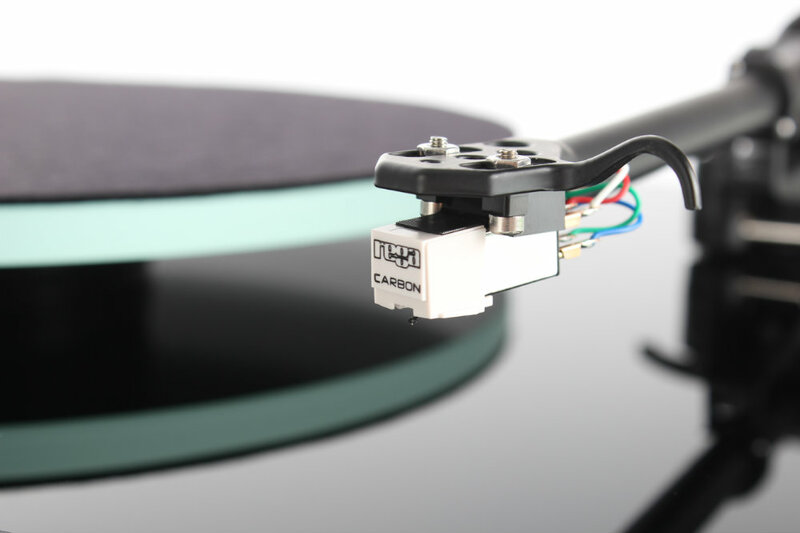 The tolerance of the RB2000 tonearm is so tight that no adhesive is used at any point throughout the construction. A brand new, low mass, precision engineered, vertical bearing assembly has been manufactured to further complement the inherent design philosophy of the RP10 turntable.The RB2000 uses the latest award winning Rega arm tube. Each one which is meticulously hand polished (keeping mass to an absolute minimum) and has been completely redesigned to redistribute mass and further reduce stresses and resonances. This advanced design tube increases the stiffness and rigidity of the overall assembly whilst reducing stress on the bearings even further. The Rega RX-ONE loudspeaker system delivers balance, detail and dynamics thanks to a unique handmade set of Rega designed drivers and crossovers.The newly developed DX-125 bassmid-range driver (using a doped paper cone) is at the heart of the RX range and combines perfectly with the Rega ZRR high frequency unit. Both mounted in a larger cabinet constructed from 18mm MDF and covered in a choice of beautiful real wood veneers, the RX-ONE will integrate perfectly into any home delivering exceptional performance within a wide range of systems System : 2 Way Cabinet Construction : 18mm MDF Real wood veneer Cabinet Design : Bass reflex Dimensions (cm) : H x W x D 34.4 x 17.3 x 26 Weight (each) : 5.8Kg Reflex Port : Rear Port Impedance : Nominal 8 ohms Sensitivity : 89dB Power Handling: 80w per channel* High Frequency unit : Rega ZRR Mid /bass driver : (Doped cone) DX-125 *Power handling figures are quoted as a guide. Amplification between 30w and 500w can be safely used depending on the quality of amplification. To ensure adequate clearance and prevent damage to the front facia, the grille magnets must locate directly onto the drive unit fixing bolts. 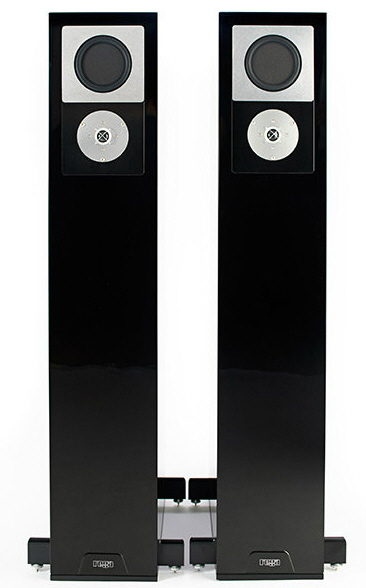 RS10 Loudspeaker The Rega RS-10’s have been designed to integrate perfectly into any system. Initially designed to complete our reference range, the RS10’s provide the perfect partner for the Isis CD player, Osiris amplifier and RP10 turntable. The RS-10 loudspeaker system offers the user the ability to adjust its performance to suit different locations via our ‘environment match’ adjustment feature.We have pioneered the integration of a BMR unit with the unique Rega ‘dual driver bass system’ and a completely new and exclusive Rega designed tweeter to create a very special and unique loudspeaker which offers unparalleled levels of control balance and dynamicsThe RS-10 loudspeaker uses a BMR (Balance Mode Radiator) to handle the majority of the audible music spectrum.The BMR design concept was conceived as a full range driver handling all musical frequencies from bass through to treble with a single driver and no crossover. This concept works remarkably well and produces a musical transparency normally associated with electrostatic loudspeakers. However no concept is perfect and a single BMR can only produce limited bass output and some people may prefer more precise musical images. Most loudspeaker systems have a crossover point for the mid-range driver and tweeter between 2 KHz and 3 KHz. This can upset the vocal region with distortion and phase shift. It is also where the human ear is most sensitive. 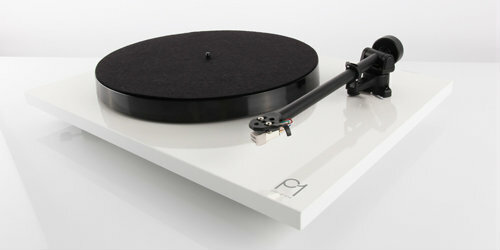 Therefore with use of the BMR unit, Rega has been able to design a crossover point above the most critical range. The high frequency capability of the BMR, has allowed the two units to integrate to 6 KHz. This gives massive improvements in sound quality with greater clarity and detail in the music. Rega has pioneered the integration of a BMR with the unique Rega dual driver bass system and a completely new and unique Rega designed and UK manufactured tweeter. The high frequency sound of a BMR is so good that the quality level of any normal tweeter will not combine with it. This is why Rega felt compelled to design a new and unique tweeter that would complement the BMR unit. This new tweeter, the ZRR-10, uses Rega’s ZRR (Zero Rear Reflection) technology combined with an unparalleled production technique that allows the silk dome to be assembled directly onto the front plate thus eliminating a major source of unwanted vibration. Each tweeter is meticulously hand assembled at Rega’s factory in the UK and incorporates a copper Faraday ring which extends the frequency response of the tweeter up to 23KHz by lowering inductance of the voice coil. Read about Rega's ZRR HF Unit Technology here... For bass frequencies, the RS-10 uses two separate bass drivers connected in parallel. The drivers are different sizes, have different resonant frequencies and operate with individually separate cabinet loadings. A 200mm driver with a lightweight paper cone, 8 layer voice coil and a resonant frequency of 40Hz operates in a transmission line with port output extending below audibility coupled with a 125mm driver also with a lightweight paper cone, 8 layer voice coil and resonant frequency of 75Hz which is loaded by a small sealed cabinet.This system eliminates the normal single bass resonance by spreading smaller resonances across the entire bass frequency band and incorporates a degree of self-damping due to the parallel connection with the amplifier. The result is a much tighter and more tuneful bass register which can be adjusted in level to suit room characteristics. The loudspeaker can also be moved closer to or further from a wall resulting in an increase or decrease of low frequency to suit personal preference Crossover: Multiple high voltage parallel polypropylene capacitors with iron dust and air core inductors / Average impedance 6 Ohms.Crossover frequencies:•Bass to Mid 300Hz•Mid to High Frequency 6KHz•ZRR-10 tweeter unit sensitivity 88dB•8 layer 125mm bass drive unit - 75Hz•8 layer 200mm bass drive unit - 40Hz /Bi-wireable•Bi-ampable – YesCabinet construction and finish:•Available in High gloss Cherry, Piano Black or Walnut•25mm thick high density cabinet, 1/4 wave transmission line designCabinet dimensions:•Height 1005mm x Depth 440mm x Width 200mm•300mm foot print. Weight per speaker: 38Kg.